« Pocket Park Re-opens with a Bang! Certainly the most colourful member of the crow family, the jay is mainly pinkish-brown, but has a black moustache and prominent black with white patches on wings and tail. The wing coverts (the “bend” of the wing) are strikingly chequered blue and black. Easily identified, but it is a shy bird. The other identification is its call – a loud and hoarse screech. It is, however, an accomplished mimic and it can copy the call of several other birds, most often those of predators – tawny owl, sparrowhawk, buzzard, carrion crow, goshawk – as a reaction to the appearance of the other bird. 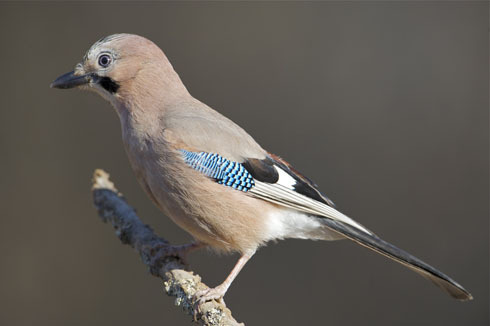 The jay is very much a denizen of woodlands, seldom seen far away from mature trees. Its chief food, especially in winter, is acorns and it will hide these in caches during the autumn. It has an excellent memory for the location of these stores, but even then it misses some and therefore helps the spread of oak woodland. At other times of the year it will eat a wide variety of other food – seeds and fruits, but also small prey such as young birds, mice and worms. An occasional failure of the acorn crop in mainland Europe can mean a migration of continental jays into Britain, sometimes on a large scale. This entry was posted on Wednesday, July 13th, 2011 at 8:06 am	and is filed under News. You can follow any responses to this entry through the RSS 2.0 feed. You can leave a response, or trackback from your own site.